Sure, he played a career-high 40 games as a rookie in 2013-14, but that was mostly subbing for injured Nashville Predators starter Pekka Rinne. Other than that, he has never played more than 32 times. So this season has been a new experience for Hutton, who signed a three-year, $8.25 million contract July 1 to join the Sabres. Hutton has played 14 of the upstart Sabres’ first 18 contests, going 7-6-1 with a 2.64 goals-against average and a .916 save percentage. At his current pace, he would make 64 appearances. A Sabres goalie hasn’t eclipsed the 60-game mark since Ryan Miller played 61 times in 2011-12. Naturally, Hutton would love to hit the 50- or 60-game milestone. “It’d be cool, right?” Hutton said Wednesday inside KeyBank Center. Hutton prefers staying in the moment, so he’s not concerned about setting a new mark for appearances. Still, the opportunity to be the starter and carry the load “is why I came here,” Hutton said. Transitioning into the starter’s role hasn’t changed much of Hutton’s routine. Hutton has morphed into the Sabres’ backbone in recent outings. During their current three-game winning streak, he has been a difference-maker. In his last eight games, Hutton is 7-2-1 with a 2.16 goals-against average and a .925 save percentage. 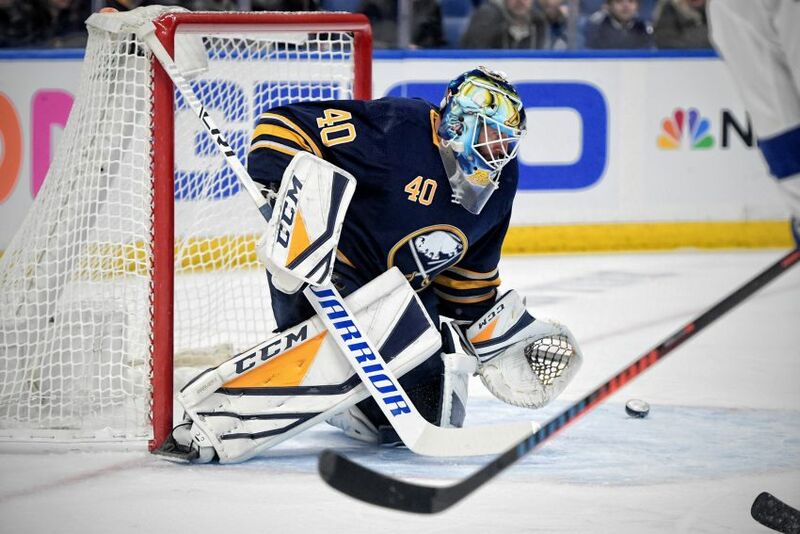 He was the Sabres’ best player in Tuesday’s tight 2-1 victory over the Tampa Bay Lightning, making 29 saves, including some critical ones in the waning minutes. Clearly, Hutton’s sound goaltending has instilled confidence in his teammates. He isn’t prone to allowing bad goals like his predecessor, Robin Lehner, often did during his three seasons with the Sabres. Before the Sabres eked out Tuesday’s win, they roared back in the final minutes and won a 4-3 shootout against Vancouver and rallied to beat Montreal 6-5 in overtime.